By achieving the highest rating for unwooded Chardonnay at this year’s Veritas Wine Awards, De Wetshof Estate from Robertson becomes arguably the most awarded unwooded Chardonnay producer in South Africa. 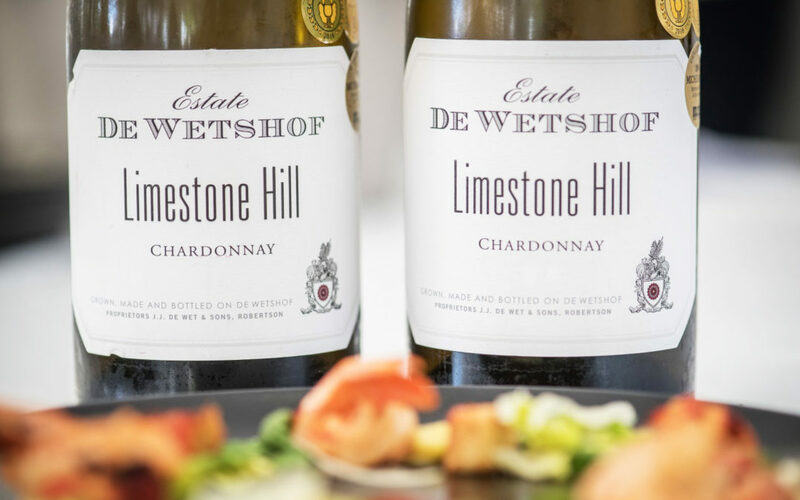 At this year’s Veritas, the top awards in the unwooded Chardonnay category both went to the De Wetshof Limestone Hill 2017 and the Bon Vallon 2017. This follows one week after these two wines achieved a Double Gold and Gold accolade respectively at the Michelangelo International Wine and Spirits Awards. De Wetshof has dominated the Veritas unwooded Chardonnay category since 2015. Last year saw the Limestone Hill 2016 winning the only Double Gold medal, with Bon Vallon 2016 and Limestone Hill 2016 (Woolworths) achieving Gold. And at the 2015 Veritas, only two Gold medals were awarded in this category, namely De Wetshof Limestone Hill 2015 and Limestone Hill 2015 (Woolworths). Johann de Wet, CEO of De Wetshof says that when it comes to awards and wine competitions, consistency is the most prized aspect of entering. “As producers we have all been one-hit-wonders at competitions, surprising ourselves and the market by achieving a single stand-out award, then never to be heard of again,” he says. He said he was especially pleased with the recognition as this is proving to be an exciting category for South African and international consumers. “Like all our Chardonnays, the grapes for the Bon Vallon and Limestone Hill wines are sourced from vineyards growing on sites specifically suited to the style of wine that is going to be bottled,” says Johann. “These are vineyards on limestone-rich soils, with a high clay component ensuring coolness and a high water-retention capacity. In its creation, the unwooded wines are kept on the lees in stainless steel tanks under cool temperatures. Weekly stirring of the lees ensures the wine extracts maximum flavours and maintains a fine balance between freshness and complexity. According to De Wet, both the Limestone Hill and Bon Vallon wines are proving to be especially popular with consumers who simply prefer Chardonnays without the wooded element. De Wet says that the un-wooded wines complement the three other oaked Chardonnays in the De Wetshof range. © De Wetshof Estate. All Rights Reserved | Designed & Maintained by breededesign.